Cough Cough! Is TB next in line??? Causes - The tiny droplets of saliva produced by a TB infected individual while coughing, sneezing or talking could contain the bacteria that spread TB. As mentioned earlier, TB is a bacterial infection! People with low immunity have higher chances of getting infected! Symptoms - The bacterium remains dormant in the initial stages and the infected person shows symptoms over a period of time. Symptoms include loss of weight, loss of energy, poor appetite, fever, productive cough and night sweats. Diagnosis - A chest X-ray helps diagnose the disease. A tuberculin skin test is done to identify TB in people who do not show up any symptoms. 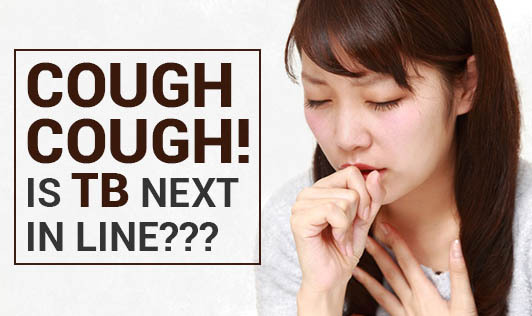 People with productive cough undergo sputum test for early diagnosis. Treatment - Multiple drugs are given to treat TB based on the laboratory results. Prevention - If diagnosed in the initial stages where the infection is not causing any harm to the host, INH drugs are given for a year to prevent sickness. BCG vaccine is given for children as a precaution.